The Evo 2 comes stock with Evo's 2 Speed Transmission. For more information about this transmission, see the its item information. The Evo comes stock with 4 sets of controls on the handlebars. On the left is the rear brake lever and shifter. On the right is the front brake lever and throttle lever. Each control operates a [Bowden_cable]. These types of cables are commonly used on bycicles and are easy to find and replace. Left: Evo's simple lever calipers and disk. Right: non-standard disk mount pattern. The braking system on the Evo 2 is managed entirely from the handlebars through the application of pressure to disc brakes on each wheel. The front and rear brakes are nearly identical. They both use a pulley to squeeze shoes onto the brake disk on scissor like arms. These brakes are a non-standard (see Disc Mounting Standards) mounting and will not accept industry standard discs calipers without fabrication. The throttle is a simple finger lever which operates a [Bowden_cable] which is routed down through the support pole and deck to the carburettor of the engine. The bottom lever switches to second gear (pulls the cable) and the top level returns to first gear (releases the cable). 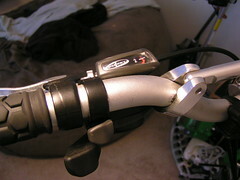 The shifter is a two lever thumb shifter which bears the name "Puzey" on the front and "microShift" on the back. It operates a [Bowden_cable] which extends through the support pole and frame to the transmission behind the operator's feet. 2nd gear is achieved by pressing the lower lever and 1st gear is returned to by pressing the upper lever. The 2's belt system is controlled by two adjustment mechanisms. The tensioner system for the two transmission belts uses a set of cams which the top of the transmission rides on. This will most likely only need adjustment when a belt is replaced. The tensioner system for the long belt which stretches to the rear wheel is manipulated by a bolt located underneath the deck of the scooter. One can simple tighten or loosen the system by tightening or loosening this belt. The 2 was generally constructed in Taiwan and shipped to the United States for final assembly. Evo's 2 began production in the United States in ?? and are currently still available from the factory. The 2 and all of Evo's powerboards have been held in high esteem since they were first introduced. Although the 2 was originally released with a flawed 1st generation transmission, Evo quickly replaced each at customer's request (without charge). The reliability of this machine has a lot to do with its inspired design, thick steel and aluminum frame and reliable Active engine. 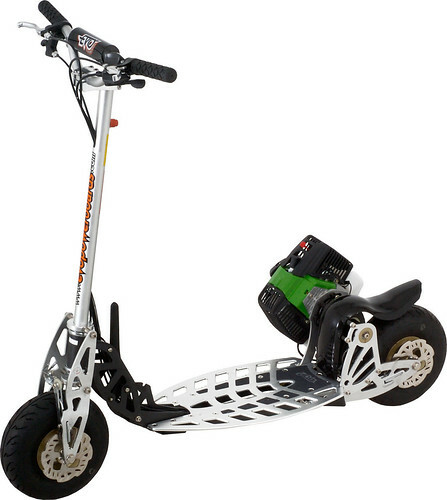 Even though this scooter is largely designed with light weight aluminum, it is reinforced with steel where necessary. This makes the frame and structure of the scooter nearly indestructible. The 2 comes with one of the sturdiest decks available for a scooter. Although it is aluminum, it is unbelievably resilient to scratching and will never bend or crack. When Evo produced the 2, they decided to use shielded bearings to support the drive mechanisms. While these shielded bearings allowed for higher RPM operation and slightly lower original price, they often became contaminated with dirt and failed around 800 - 1000 miles (depending on driving conditions). If the bearings weren't replaced before they failed, often, they would do considerable damage to the rest of the transmission. A simple bearing replacement can also be done for less than $50 and without access to a shop. Although the Active 40 is as reliable as an engine can get, it's lack of performance leaves a lot to be desired. If the 2 is being used purely for transportation, the Active 40 will provide enough power along with the two speed transmission, but if any real speed is desired, an engine upgrade should be the first step. Nothing! This scooter was built to be a high performance machine and that is exactly what it will be for a long time.